Olaratumab is a monoclonal antibody for the treatment of solid tumors. Vorolanib, also known as CM-082 and X-82, is small molecule dual inhibitor targeting human vascular endothelial growth factor receptors (VEGFRs) and platelet-derived growth factor receptors (PDGFRs) with antiangiogenic and antineoplastic activities. N-Desethyl Sunitinib is a metabolite of sunitinib. 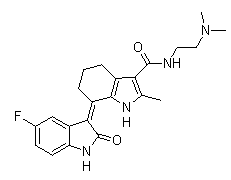 JNJ-10198409, also known as RWJ-540973, is an inhibitor of PDGF-BB tyrosine kinase with an IC50 value of 4.2 nM. Potent and selective inhibitor of VEGFR and PDGFR tyrosine kinases (IC50 values are 0.8 and 19.4 μM respectively). Selective over EGFR and c-Src tyrosine kinases. DCC-2618 is a pan-KIT and PDGFRA inhibitor, and has antitumor activity. SIM010603 is a structurally novel, oral, multi-targeted receptor tyrosine kinase inhibitor. TG 100572 is a multi-targeted kinase inhibitor which inhibits receptor tyrosine kinases and Src kinases; has IC50s of 2, 7, 2, 16, 13, 5, 0.5, 6, 0.1, 0.4, 1, 0.2 for VEGFR1, VEGFR2, FGFR1, FGFR2, PDGFRβ, Fgr, Fyn, Hck, Lck, Lyn, Src, Yes, respectively. ABT-348, is a novel potent and orally bioavailable inhibitor of the Aurora kinases as well as the VEGF and PDGF families of receptor tyrosine kinases and is currently in Phase I clinical trials.